Vacuum sealed chicken cuts, ground turkey/beef, and fish fillets in portion sizes that work for you to quickly pull out and thaw for your family. Pre-cut chicken breasts for recipes that call for diced up chicken, then divide it up into freezer-lock containers in the amount needed. This eliminates the mess of raw chicken each time you make those meals. Pre-make family favorites like taco meat or spaghetti bolognese rather than making each batch individually. Keep salmon, turkey, chicken, and burger patties for easy, on-hand items to put on the grill for lunch, dinner, or the unexpected dinner guest. Freeze extra turkey or ham after the holidays to use in a future meal. Plain brown rice or quinoa, as well as recipes for items like Mexican and fried rices, can all be batch-cooked and then divided into freezer-safe containers in the amount needed. This eliminates having to use instant products or boil and prepare each time these items are on the menu. Extra sandwich bread, English muffins, hamburger/hotdog buns, or dinner rolls can be stored to prevent from spoiling in between being eaten. Leftover vegetables or pre-cut veggies that went uneaten can all be frozen and combined later as a hodge lodge for items like vegetable minestrone soup. Pre-cut frozen peaches, cherries, and berries make it easy to throw together a crisp or cobbler on nights you need to make a simple dessert. Uneaten applesauce, canned fruits, and canned pumpkin all freeze well when opened and left unused. Transfer to freezer-safe containers before storing. Freeze excess milks and creams that are called for in the occasional recipe but don't get entirely used up. Date and label the amount on a freezer-safe container, then thaw and use in future recipes when buttermilk, whipping cream, half and half, etc are called for. Buy cheese in bulk to save. 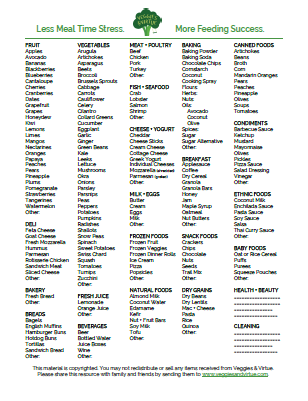 Pre-shred and save for use on items like build your own pizza, lasagna, homemade macaroni and cheese, etc. Freeze ice cube trays with your preferred dairy or non-dairy milk alternative to add in place of ice for cold coffee drinks. Make your own frozen yogurt and keep in a freezer-safe container to have as a healthy dessert option on hand. Buy nuts and seeds in bulk and store larger, unused portions in freezer so they last longer. Keep chia, hemp, and flax seeds near your smoothie ingredients for an easy, healthy addition. Make homemade popsicles and keep frozen. Enjoy as a healthier and less-expensive alternative to store bought varieties all summer long. Freeze batches of cookie dough in individual portions so cookies can be baked individually or in small amounts. Divide up larger servings of pre-cooked items like cookie bars and cakes and freeze to enjoy at later times. This helps lessen the temptation of having a whole batch calling your name from the counter! Make extra crisp/cobbler topping and divide into freezer-safe containers. This can be added on top of any fruit at a later time when you need to prepare a super quick and easy dessert option. Keep shredded potatoes on hand, or prep and pre-roast extra potato hash to lessen the prep time for future frittatas. Store unused cartons of egg whites in freezer to prevent from spoiling. Make extras of whole-grain pancakes, waffles, and french toast to easily toast up on busy mornings. Keep muffins and breakfast cookies in freezer for grab and go breakfast options that are quick to reheat. Save on all-natural breakfast meats by buying items like bacon, sausage, and ham on sale or in bulk. Store in smaller portion sizes to pull out and use as needed. Batch-cook marinades for recipes your family frequently eats. Store in the amounts needed for single-recipes using freezer-safe containers. Cut up and keep extra herbs in a freezer-safe container to add to upcoming recipes. Blend extra herbs with olive oil, then freezer in an ice cube tray for a flavorful addition that can be used later on. Prep extra batches of family favorites, then date and label in freezer-safe containers. These can then be cooked up quickly with little to no prep time necessary. When it comes to meal planning and prep, storing healthy staples in our deep freezer is one of the biggest tricks I utilize to make sure we always have healthy meals on hand. We found our first deep freezer to be a worthwhile investment when I was nursing our first daughter and storing up the extra breast milk. During this season as new parents, our deep freezer also provided us with the space for several make-ahead freezer meals that every new mom needs. For these reasons alone, even a smaller chest-sized deep freezer is something I would encourage all young families to at least consider investing in one early on. Now that we moved out to "the country" and are 20 minutes from a grocery store and 30 minutes from a Costco, we have upgraded to a full-size deep freezer. This has caused me to realize that although I love grocery shopping in a geeky way, buying the same exact staples each week used to drive me crazy. It took unnecessary time to plan and shop for, and it positioned me to purchase whatever items I could find despite them being a good deal or not. Paying too much for healthy food when I don't have to is another thing that drives me crazy, so thankfully keeping a properly stocked freezer has minimized how often that happens. Buy in bulk or when items are on sale and save. Shop less frequently for staple items my family eats frequently. Tote my toddler through the grocery store in a less-stressed and more-efficient fashion. Batch cook quick and easy make-ahead meals. Have a meal ready in minutes any night of the week, while requiring no major meal prep or planning. Optimizing your freezer space, no matter how big or small it is, can create a real time-, money-, and sanity-saver. Consider how keeping an ample freezer stock of these freezer staples may benefit your family's food supply.